By now many of you will be aware of the video below, apparently taken on 13 December 19841 at a karate dojo in Dumfries, Virginia. It shows a brutal, unprovoked and totally reprehensible bashing of a young mentally disturbed man who claimed to be a kung fu practitioner "taught by Jesus". The video has gone viral. Possibly the only good thing to emerge from this is the universal outrage and condemnation it has provoked.2 That people should have such a sense of outrage in this day and age of "ground and pound MMA" and other media violence which has a "brutalizing effect" is surprising, but also gratifying. It restores a little bit of my faith in humanity. The now infamous video of the bashing at a Virginia karate dojo in 1984. Warning: this video contains highly disturbing footage. The previously mentioned deranged man (I shall call him KFG - "kung fu guy" for want of another label) turned up at the karate dojo, possibly by invitation (apparently4 having been at an auto parts store next door). Regardless of how KFG came to be there, it is now abundantly clear that the instructor allowed him to remain for one purpose and one purpose only; so that he (KFG) could be beaten senseless for "sport" or "fun". In the video the instructor is seen introducing KFG and inviting him to demonstrate to the students at the dojo with the words "We’re all in here for knowledge, aren’t we gentlemen?" and "Go ahead and demonstrate around him", referring to his student who was standing ready nearby. I think it is important to note that at all times KFG makes it clear that he does not want to fight or otherwise hurt anyone. Addressing the student, he says: "You can just stand there, do not make any movement whatsoever I will not touch you," adding: "I think it would best maybe if perhaps if I just perform which is known in karate as kata." Later he says: "I just wish to teach you, I don’t wish to hurt you". What ensues moments later can only be described as both vicious and cowardly. The supposed "karate" student throws an completely unexpected kick at KFG's groin area. A scuffle ensues in which KFG shows some reasonably adept skill (amongst some rather grandiose movements). In this scuffle it is quite clear that the student is intent on hurting KFG, but KFG holds his own while clearly pulling his own punches. The student is so inept he even falls over at one point. Nonetheless he continues swinging wildly, pressing KFG with relentless attacks. Throughout this barrage the reluctant KFG continues to plead that he doesn't want to fight. A number of times he says: "Don't do that," and even says: "I'm not a fighter". To cut a long and distressing story short, the student continues the attack until he eventually manages to land some very nasty blows. At this point KFG clearly "concedes the match" saying "you're good" and "you've got it". His body language shows that he is giving up. The student is however emboldened and presses on with knee kicks to the unfortunate KFG's head. The assault only ends when the student stamps repeatedly on the head of the now semi-conscious KFG. The image is so disturbing that I cannot bear to look at it again. What follows is perhaps even more macabre. The instructor nonchalantly instructs his students to drag the unconscious KFG from the dojo. As I recall he is visibly struggling to breathe and appears to have suffered serious, life-threatening injuries. The camera then cuts to footage taken by the instructor at some later point - possibly the next day. He "blithely" points out the trail of blood left on the floor and the smears of blood on the back door where his students "drug him out" (sic). It is abundantly clear to me that while the student carried out the beating, he was aided, abetted and encouraged by the instructor. In fact, I strongly suspect that the instructor counselled and procured the beating. Much can be gleaned from the instructor's own attitude in the following video where he lectures his students that they can do "what they want" in his dojo. He says: "So show your power. Enjoy yourself." To me what is most disturbing about all of this is the instructor's lack of any semblance of human empathy. In fact, he doesn't even appear to realise that others will find this lack of empathy objectionable or distasteful. In this respect he might as well be from another planet; he simply doesn't get that others will be disgusted by his words and actions. He seems incapable of differentiating the kind of beating given to KFG from a Simpsons cartoon. He would put both on an equal footing. Again, this is further backed up by his own apparent posting of the video on Youtube.4 It's as if he put it up expecting people to have a good laugh and say: "Well done! Very funny!" His own lack of awareness of the typical human reaction to his video is telling. It is certainly arguable that the instructor's behaviour is indicative of what is known as "Dissocial Personality Disorder",5 one of the key indicators of which is the "callous unconcern for the feelings of others and lack of the capacity for empathy". Whether he has this disorder or not, I wish to pause for a moment to consider it in a bit more detail. People who have this condition are often referred to as "psychopaths". The latter is a term wrongly associated with psychosis and/or is often inaccurately used as a short-hand reference to serial killers.6 In fact psychopaths can often live relatively law-abiding lives among us, never understanding our instinct for empathy, though sometimes learning to mimic it for the sake of social convention. However superficially charming they can be,7 they remain, essentially, heartless. And it is precisely this attribute that is most chilling. During my time as a prosecutor I noticed that the crimes which most appalled people were not the crimes of passion, however brutal and violent. Rather, what disturbs, worries and distresses people the most are crimes that appear to have been carried out coldly and without any sense of guilt, remorse or indeed any feeling other than "glee". These disturb the bulk of humanity because we cannot relate to those who would commit such crimes. We can't explain or understand the motivation. It is completely at odds with our very nature as social beings. Without being able to come to terms with the motive, we can't begin to address the root cause. We can't prevent it happening again. There can be no greater evil than the absence of empathy. Now I recognise that "evil" is an emotive and relative term. However I use this word anyway (for reasons I will discuss in a moment). Going back to the subject of "evil", what do I mean? I am reminded of a movie from the '80s called "The Time Bandits" featuring Sean Connery. In it, the Devil cackles and rubs his hands with glee saying: "Suddenly I feel good." His henchman then pipes in: "I'm sorry Master," to which the Devil replies: "Don't worry - it'll pass." Is "evil" some cackling persona, rubbing his hands and wishing horrible things upon us? I find this notion absurd. It assumes that there is an "absolute evil" that exists independently of us all. I can see no evidence that "evil" is anything other than a relative thing; what was "bad" for the bulk of humanity was seen as "good" by Hitler, etc. Sinologist Arthur Waley notes in his work "The Way and Its Power" that all societies passed through a "pre-moral" phase - ie. a phase where there was no concept of absolute badness or absolute goodness. If a lion bit your friend's head off, that would be bad for your friend and bad for you. If you had a bumper crop or if you killed a mammoth for your tribe to eat, that was good for you and your tribe. So words like "good" and "bad" were merely relative terms. The concept of "absolute" badness or goodness (ie. independent of any person's perspective) arrived much later. We see this even today in our use of words like "virtue"; on one hand we use it to refer to "goodness" in an absolute sense. Yet we also use it in its original sense when we say things like "by virtue of". In the latter case "virtue" has it's original meaning of "power" (ie. the power we have to make things happen in a way that we want them to). "Virtue" in its original sense was an "amoral" (as opposed to a moral or an immoral) term. 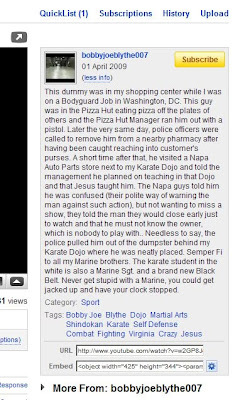 So how do I reconcile this analysis with my own label of the actions of this karate instructor and his student as "evil"? If we are to give the term "evil" any meaning today other than a purely relativistic one, then I believe we ought to proceed from the perspective of the social contract.11 Clearly we, as a society, exist because of our shared empathy. The level of empathy might vary between individuals, but at some point most of us have some sense of community. Psychopaths do not. Their entire existence is at odds with the very concept of "society". Their behaviour is not constrained by any sense of compassion or shared empathy that is the basis of our morality under the social contract. They exist outside this "sphere". Psychopaths, whether criminal or not, are as near to the "cackling Devil" as we're likely to get. A lack of empathy can be traced to all the greatest "wrongs" done against our fellow man. It alone has the capacity to sweep aside conventions that enable us to coexist peacefully and cooperatively. While ordinary men and women can get caught up in a cycle of rage and hatred, only someone without compassion can sustain such an environment for any extended period - coordinating it for his or her own ends. When I look at the video that is the subject of this article, I am struck by one thing over all others; the lack of any empathy shown by the instructor towards the unknown person I have called "KFG". It is, in my view, a glimpse into the "heart" of evil. 1. The date and time are volunteered by the instructor in the video footage, however others query the accuracy of this information. As an aside, that day happens to have been my 18th birthday. 2. Here is just one video of a person expressing outrage at the beating. It is fairly representative of thousands of such responses, in blogs, videos and forum posts. 3. A full transcript of the encounter can be found here. The instructor's own revealing, disturbing and incriminating "information" posted about his video of the bashing. 5. See this wikipedia entry. 6. Psychopaths need not even be criminals, as you will note from this wikipedia article which states "Psychopathy does not necessarily produce criminal and violent behavior". 7. See Factor 1 in Hare's Psychopathy Checklist in relation to psychopaths. 8. Not much can be gleaned about the character of the student. Regardless, it seems clear to me that he is acting "under orders". The Milgram Experiment changed our perceptions about how ordinary people can commit horrific acts just because they are "under orders". For a modern version of the experiment see this video. 9. It seems that there might be a statutory limitation period preventing prosecution of the student and his instructor - see this discussion. 10. Waley, Arthur. The Way and Its Power. London. Unwin Paperbacks 1977, p. 20. 11. See my discussion of the "social contract" here (albeit I'm speaking the context of healthcare, my general point about caring for one another as part of a society still applies). Violence is part and parcel of the human experience. But when violence is divorced from any notion of survival or self defense, and executed for either sport or pleasure, evil creeps in and the soul is laid to waste. Recent rumblings about violence in the martial arts are bandied about with unconscionable glee like schoolyard boasts. Violence is a very serious ethical issue and should be approached as such. MMA trivializes violence as a spectator sport and nothing is further from the truth than believing organized violence could be a pastime. Martial arts have in general been partially seduced by this siren song. It is very brave of you to take such a strong stand. We are all susceptible to falling into a rationale for violence as a vindication in and of itself. But with no ethical underpinnings, violence is evil. It is that simple. "I don't for a moment want to suggest that the student shouldn't be liable to such punishment as he deserves under the law. That much is obvious." But if the student was pawned into doing it, doesn't it make sense (though I don't know about from a *legal* standpoint), that they should receive only the minor portion of the punishment, with the major portion going toward the "instructor" nutter? Especially in light of the results of the Milgram experiments -- which makes me wonder just how much punishment is really right to levy against the "student", vs the "instructor" who was in charge. This doesn't mean they shouldn't receive any, but it makes me wonder if the ratio of instructor:student punishment should be a lot greater than "2:1". (b) general deterrence (the need to ensure that there is an appropriate consequence for a criminal act). You'll note that I refer to general deterrence. That is, I am not referring to specific deterrence (against an individual). And you'll also note that I place deterrence second to the primary goal of incapacitation. At the moment, almost all legal systems actually function in a retributive paradigm - dressed up with post hoc justifications such as deterrence and incapacitation. In other words, we pay lip service to the latter aims and focus on a "punishment should fit the crime" philosophy. (b) if he is not likely to reoffend, what punishment must nonetheless be imposed to ensure the general deterrent effect. In respect of the former, I feel this particular instructor is a sociopath/psychopath with no human empathy. This makes him inherently dangerous and unfit for society. I would have him under some form of permanent detention or at least intensive monitoring since I doubt he will ever be an appropriately functioning member of society. His student is probably not in the same boat (in terms of danger to society) - hence I might well arrive at the same 2:1 ratio as you, but for a different reason. My training was originally for the express purpose of defeating or killing sociopaths. Thus people who break social compacts are not all that surprising to me. I've studied their behavior long enough that it is no longer surprising or all that strange. To defeat an enemy, one often starts to think like the enemy in order to predict their moves. And that is as true now as it was in Sun Tzu's days. MMA is not asocial violence. MMA is even more regimented than anti-social barfights that end up with people dead more often than most realize. MMA is a sport, like amateur bare knuckled boxing. It's for entertainment, set within a social contract. People confuse asocial violence with social uses of force, as if they were the same thing. Asocial iolence only has one goal: destroy and shut down another human. Society has "goals" it wants to achieve like "put people in their place". What the gym guy did was "socially" acceptable in his part of the neighborhood. Different societies have difference tolerances and uses for social aggression. But asocial violence is always about getting rid of people, not communicating something. For example, instead of dumping the guy, after teaching him a lesson, in a dumpster out back, an asocial individual would simply have hacked off the limbs and video taped himself having a cookout on them. That's asocial, defined as having no relationship whatsoever to ANY society's rules. Sociopaths are literally people who do not understand how societies function and can never be part of any society, criminal or citizen. Criminals, rapists, and murderers still have societies: rules they obey. Serial killers like BTK, can mimic social responses to survive longer, but that's due to intelligence, not due to voluntary membership in how societies work. He still doesn't feel any guilt, even if intellectually he can mimic all the right social indicators.